America has found a growing interest in cocooning. According to the Hearth, Patio and Barbeque Association this trend is the result of the growth of outdoor living phenomena, spurring from the shift in preference from a dynamic lifestyle to a more laid-back one. Factors such as an aging population and the popularity of home improvement projects have contributed to the onset of this trend. Now, people spend more time at home particularly in outdoor spaces, occupied with gardening or organizing simple gatherings. Porches, patios and decks have been designed either as a luxurious extension of a home or as a cozy spot amidst all the lush vegetation in a backyard. Flooring is the core element of any space. In designing outdoor spaces, choosing the right materials for paving will play a crucial role in defining the overall appearance of the outdoor area. Patio pavers are popular materials among homeowners, landscape designers and architects for outdoor improvement applications. A variety of patterns can be created from the wide selection of patio pavers each having unique shapes and colours. For starters, patio pavers are classified into three main categories, based on the type of raw material that was used to manufacture them. Brick pavers are made from clay. Stone pavers are made from natural stones such as granite, sandstone and limestone. Concrete pavers, as the name suggests, are made from concrete. Brick pavers and stone pavers are generally made from natural occurring materials while concrete pavers are synthetic. Combinations of these materials evoke different moods. Patio pavers made from bricks and natural stones may have an old earth appeal, while concrete pavers may convey modernity and order to the space. 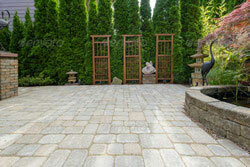 The popularity of patio pavers as home improvement materials stems from its durability, affordability and flexibility. Concrete is a material that can withstand harsh weather conditions and improves its strength over time. As with concrete, bricks and natural stones do not easily erode when subjected to heavy loads. Among patio pavers, concrete is the most affordable yet the most durable material. One common characteristic of these materials is that all types can be shaped to form desired patterns and designs. Backyards and decks are slowly being transformed as alternative living spaces. With the right materials, these spots can become the go-to places for relaxation, cooking and entertainment. With these additions, you can bask in the outdoors without ever leaving your own living space. Homeowners want to enjoy their homes, but they also see upgrading their back yards as an investment. Using concrete pavers for patios, sidewalks, and driveways is becoming more and more popular in the United States and Canada, because of their affordability, strength, and durability. Patio Pavers offer a wide variety of paving options. With the many sizes, shapes, colors, designs and patterns available, combined with slip resistance and attractive finishes, patio pavers are one of the most versatile paving products available.